UniversityRooms.com is a unique website offering visitor accommodation options in university and college halls of residence. It provides both short-stay and long-stay accommodation options in over 400 university colleges and student residences in 120 cities around the world. 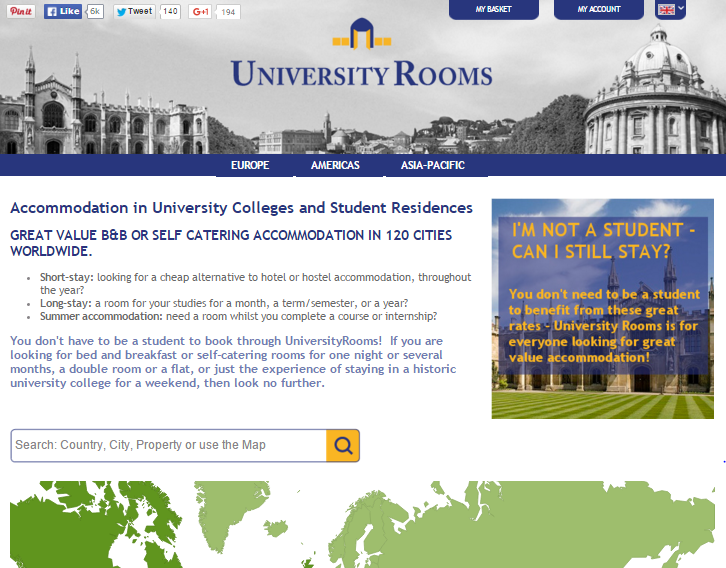 UniversityRooms’ aim is to fill empty rooms in student halls during the academic year and in the summer vacation. You don’t have to be a student to book through UniversityRooms. It’s a convenient budget accommodation option for travellers and groups and an interesting opportunity to experience life within a university and benefit from use of the facilities. The site is powered by SpeedyBooker. Before booking, have a look through the net to see if you can find a promotional code for SpeedyBooker. Promotional codes are only issued in very exceptional circumstances, by individual venues, and not in response to requests. Universityrooms.com is an interesting accommodation site for those looking for somewhere to stay, short-term or long-term in London. If you are looking for bed and breakfast or self-catering rooms for one night or several months, a double room or a flat, or just the experience of staying in a historic university college for a weekend, then look no further. Go back to our Student Accommodation in London category to find more websites offering accommodation solutions in London.